When one says the word 'Monaco' to an F1 fan several things no doubt spring to mind. Even over and above the usual slightly wearing stuff about posers on yachts and ostentatious wealth. And in terms of what we associate on track with Grands Prix around the Principality we got just about all of them in a single afternoon today. First off, the stuff we know about. For much of the way we got the slightly tepid entertainment we've grown to expect here. And with it something else we've seen plenty of times through the famous circuit's confines of the guy out front looking masterful with the race at his mercy. Today that man was Lewis Hamilton. Leading into the first turn here is thought to be about 95% of ensuring the win and for Lewis, who managed that after his fine pole yesterday, for much of the way it looked 100%. At least. Immediately he cleared off from team mate Nico Rosberg in P2 and Sebastian Vettel's Ferrari in P3, who ran as a pair throughout, and did so decisively. He was 0.8 seconds away at the end of the first tour, 2.4 after five. Around there it hovered for a while (Lewis apparently managing a brake problem for a time), then when they hit traffic Lewis made yet more hay, and come lap 25 his lead looked an unbeatable eight seconds plus. It stayed of that order after all made what we assumed was to be their only tyre stops. Such is Monaco's way it looked all over bar the shouting. But Monaco has another way. A flip side. 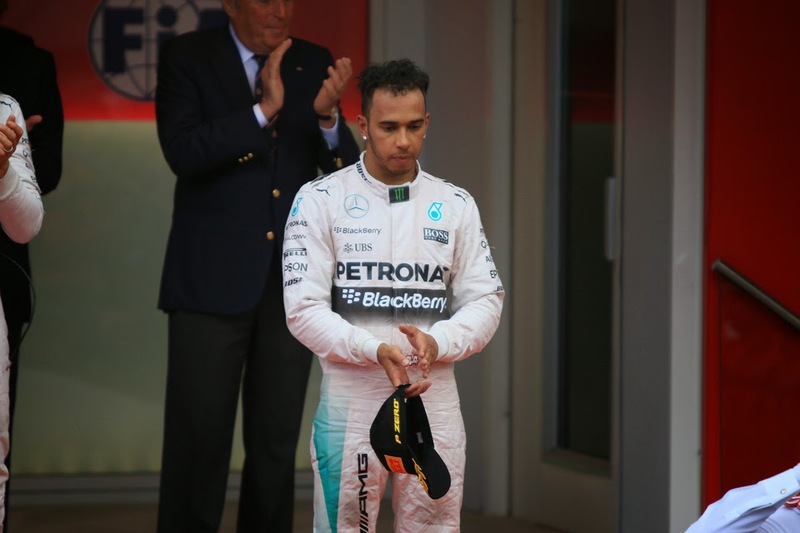 And everyone - especially one assumes Lewis - was sharply reminded of it before this Grand Prix was out. From small acorns mighty oaks grow, and this one started with a rather violent crash at St Devote from Max Verstappen - who'd looked racy all day but was set back by a 31 second tyre stop - getting it wrong on lap 63 when trying to spear past Romain Grosjean. He was OK thankfully. This heralded eventually a safety car. Some decided they had nothing to lose and pitted their cars for fresh tyres for the final few laps' sprint. And astonishingly this band included whoever or whatever was in charge of Lewis's strategy. Having appeared for more than an hour and a half to have the race in the palm of his hand we suddenly had the almost surreal sight of Lewis relegated to third. Lewis pitted; Nico and Seb didn't, and Lewis emerged just behind the two. But the margins while tight, were vital. "I've lost this race haven't I?" said Lewis. He had. Not even Lewis in the eight-lap dash to the line under green flags could find his way around Vettel nor did it even look likely, with Seb aided by a car that looked rapid on the closest thing Monaco has to straights. Nico meanwhile smartly cleared off, relieved that his tyres that he said felt initially "like ice" got switched on quickly. By the end the trio remained in that order. Sure enough too the acrimony that kicked off from the point that the chequered flag fell far outstripped in dramatic terms most that we'd seen before that day. Mercedes boss Toto Wolff tried to emolliate. Speaking of a miscalculation, that they thought they had time to pit and maintain the lead (perhaps they didn't realise that Lewis had lost time just before pitting after reaching the safety car on track); that Lewis had mentioned a drop in tyre temperatures on the radio. Presumably we can infer also they were wary of Vettel pitting and attacking on fresh rubber. But, observers pointed out, why on earth take the risk? Where on earth did the Merc decision-makers think they were? 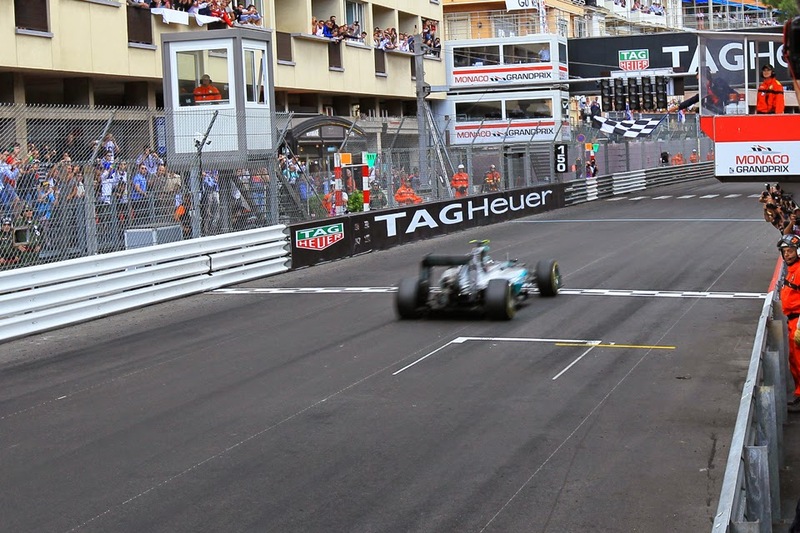 It's Monaco where track position is nine tenths of the law. Or ten tenths. Lewis was in the box seat so long as he led; a freshly-booted Seb would have had no chance of passing just as a freshly-booted Lewis didn't. To top it all Ferrari's crew wasn't even out in the pit lane so didn't look likely to call in Seb in any case. And even Wolff accepted that despite his pleas of mitigation "we should have had the overview and not risk it." "I'm just so sorry" he continued, "it was an easy win for Lewis...we just screwed it up for him...there is nothing left to do but to apologise, apologise and apologise". It all rather screams of a team being too clever by half. Taking logical points to illogical conclusions. And while it's easy to criticise this isn't the first time that Merc's strategy has rather crumbled when making calls under pressure, and seemed to beholden to its 'systems' at the expense of human savvy. One thinks of Malaysia this year. Hungary last. The team's non-executive chairman Niki Lauda meanwhile was scathing, speaking of "confusion...a lot of people talking and wrong decision, very simple to say." "It was not necessary...no question about it." When asked if the team had lost Lewis the race he stated: "Yes, clear, no discussion...honestly I really feel sorry...this is for me unacceptable." 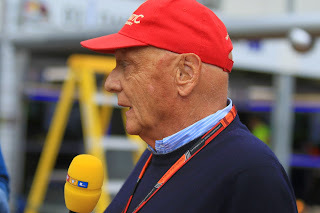 It terms of what will happen next for the team Lauda again was blunt: "Analyse it properly and then see where the mistake is." After stepping out of his car Lewis's frustration, and almost shell-shocked state, was plain, but to his credit he managed to maintain his dignity. "Refocus tomorrow...and come back and try and win the next race. That's all I can do" he said. 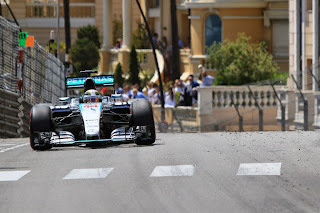 "It's very difficult at the moment but I'm world champion so I need to behave like one...Today I showed my pace, I showed what I can do here at Monaco, so I feel content in my heart that I did everything I could...It was a collective decision between us all..."
The plot thickened slightly too as Lewis in the post race press conference hinted that he, however inadvertently, may have contributed to the downfall: "I saw a screen and it looked like the team was out and I thought that Nico had pitted. Obviously I couldn't see the guys behind so I thought the guys behind were pitting, so when the team said to stay out I said that these tyres are going to drop in temperature and what I was assuming is that these guys are going to be on options and I was on the harder tyre, so they said to pit. So without thinking I came in with full confidence that the others had done the same." 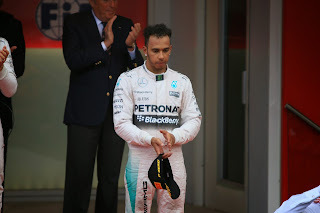 As for Nico, he too had the grace to accept that this one was inherited: "Very strange...the whole team is not ecstatic at all, quite on the contrary because they know that Lewis would have deserved to win today" he explained. "But it happens of course, that's the way sport is...sometimes sport is hard on you and it's horrible... today was probably the luckiest I have ever been in my career but I'll take it. "Today ranks as one of the most horrible moments for him (Lewis) in his career, no that would be of course in Brazil losing a championship but it won't be far off that, because Monaco is Monaco...and especially since he's done such a great job this weekend, he drove awesomely..."
Of course Nico, as Bob Dylan once sang, can't help it if he's lucky. 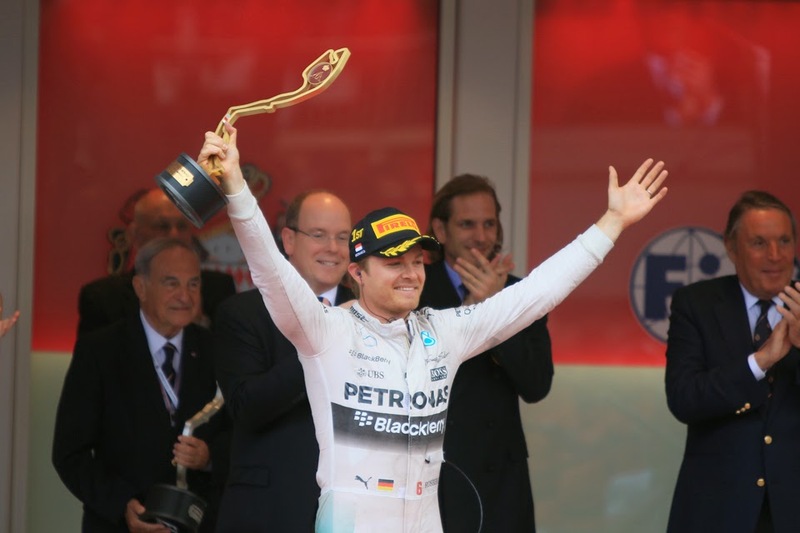 He also today got his first ever back-to-back Grand Prix win meaning he's now but 10 points shy of Lewis in the table. Another thing easy to miss was that he with it became the first since Ayrton Senna to win three Monaco Grands Prix in a row. It's worth remembering too that even Ayrton inherited three of his six Monaco triumphs. Such is racing. Here especially. Seb merely smiled at the unfolding soap opera, and that he as a result of it all had managed to scavenge three more points than he'd thought he would. He'll be happy too that once again he got close enough to the Mercs to distract them into a fumble. 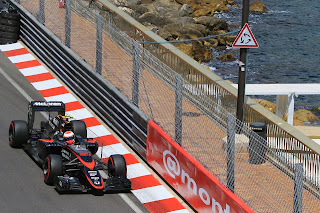 Almost unnoticed amidst it all various other things happened in the Monaco race today. Daniil Kvyat got a strong and highly timely fourth place finish. He was aided too by some Red Bull synchronised swimming as his team mate Daniel Ricciardo was one to pit under the late safety car. He was allowed past Kvyat on fresher tyres but the arrangement was that if he couldn't make further progress the place would be given back to the Russian. He didn't, so they did switch back. Ricciardo also was a little lucky to get away with a late pass on Kimi Raikkonen that looked more BTCC than F1. He was very lucky when compared with an earlier incident involving Fernando Alonso and Nico Hulkenberg earlier in the race that was punished. Sergio Perez continued his mighty weekend with an appropriately mighty seven place finish, and Jenson Button ended McLaren's 2015 points drought, indeed got four of them by smoothly as ever - and this time rapidly compared with the cars around him - bringing it home in eighth. 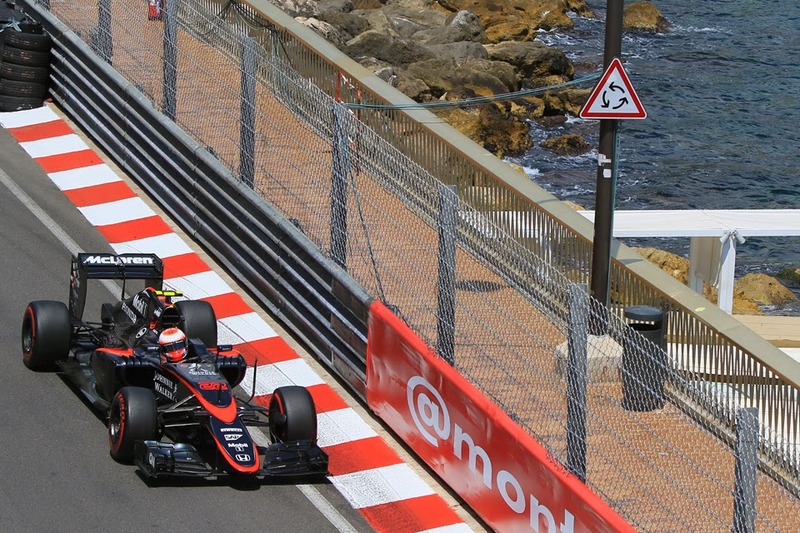 Alonso likely would have followed him home but for a mid-race gearbox failure. While Felipe Nasr finished a sound ninth and Carlos Sainz somehow after a pit lane start completed the point scorers. 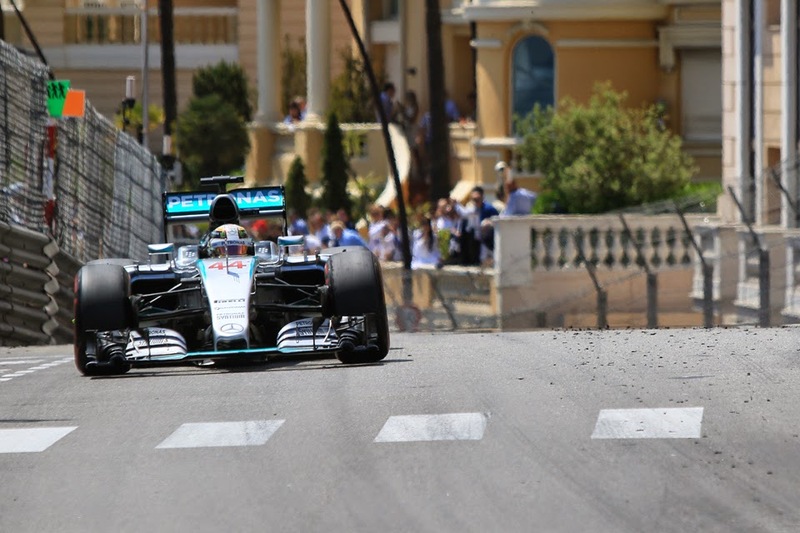 A fine performance by Hamilton both in and out of the car - pure class! One question that will never be answered is would Mercedes have asked Rosberg to let Hamilton by if Hamilton had got out in front of Vettel. That would have been a tough call, because Rosberg was going for the hatrick. Mercedes are lucky that presently they are not under a serious threat for the championship, if they were I would want Ross Brawn on the pit wall. Hi Osborne. I agree that Lewis was brilliant all weekend pretty much (including in his response to his misfortune); as he said himself he can be content that he did his side of the bargain at least.